Chatter around the office these days from the young moms we work with often touches on Halloween. Most specifically the costumes to be worn by their little trick-or-treaters. It was also the topic of discussion at a family gathering yesterday as my daughters discussed the plans for their wee ones. The oldest of the three, who at the age of three can articulate a preference, has decided that she will be a "so beautiful butterfly". Her cousin, a toddler, is keeping the insect theme going as a bumble bee, while the choice for her little brother is all about matching his blond locks and personality. He, it has been decided, can only be Bam Bam. I even enjoy getting into the spirit myself on occasion and I loved figuring out what my kids would be wearing each year. When they were small, thinking of what they could be, a costume that would be cute but would keep them warm as we travelled from door to door on what was typically a miserable late autumn night was a fun dilemma. As they got older the challenge was to come up with their perfect costume without breaking the budget. So many times I wished for a modicum of sewing ability or that I was more innovative, because it was now important that they look good in front of their peers. 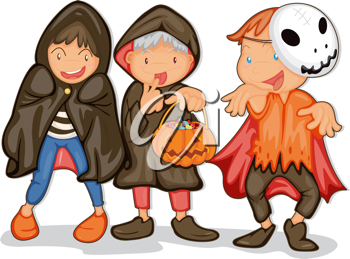 Currently, though, the fun for me is greeting all the little trick-or-treaters at my door, especially the tiny ones disguised in adorable animal costumes, or as fairy princesses and the popular cartoon heroes of the day.